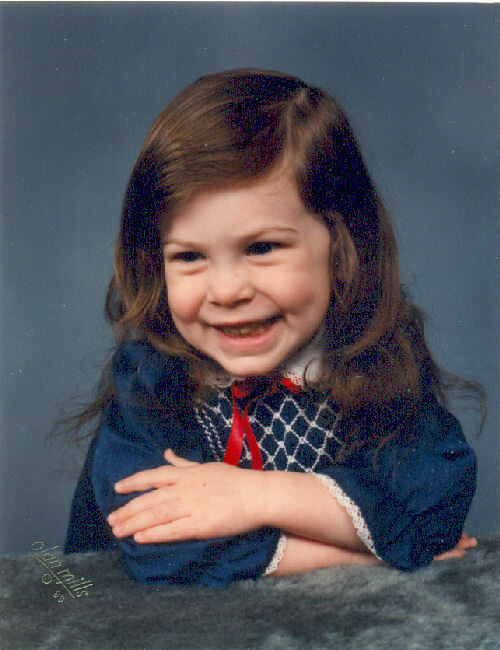 Do you know I was the cutest kid in the whole wide world when I was 3? No, really. I’ll show you. See? I told you so!! Yes, she is cute. 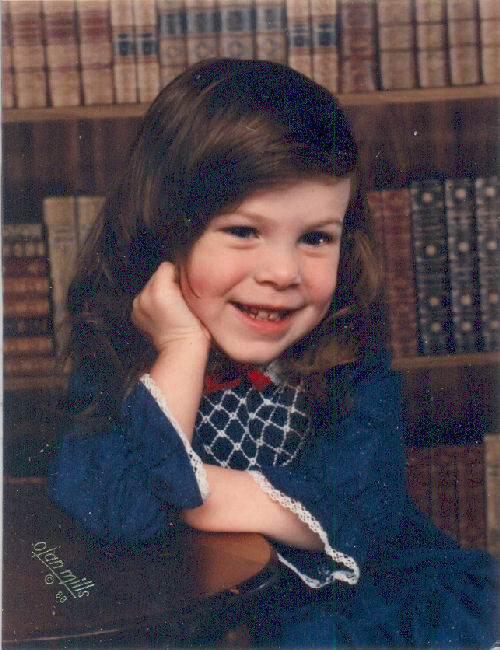 She has been cute since the day she was born, and she continues to be cute. And everyone tells her so, so she knows it. Which makes me have to do horrible things like let her see a glimpse of the future in me. And laugh evily. She is not only cute, she knows how to dress herself, when she puts her mind to it, proving that Mr. Sartoralist is looking in all the wrong places for his fashion shots. He should come out to out-in-the-middle-of-nowhere to see the real deal. This picture was taken at the end of last January. No one in their right mind would be wearing a sun-dress, but, undeterred, she found not only blue-striped tights but a perfectly coordinating blue-striped shirt, with silver shot though it. 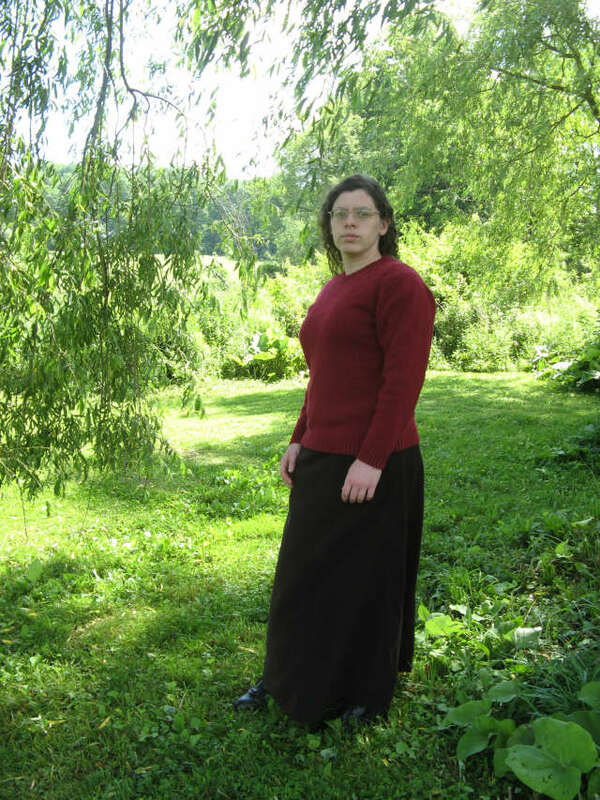 And then accessorized with green clogs, blue hair bands and two braids. And a yellow necklace for accent, and who told her that yellow is the official accent to blue and green? I didn’t even know she owned half this stuff. But she, apparently, knows her stuff, and will not be stopped by things like inclement weather. 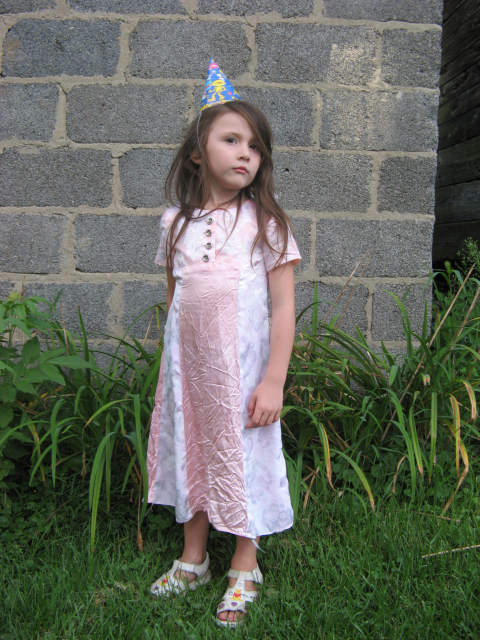 Here, she decided she would wear her getting-smaller-and-wrinklier-by-the-minute princess dress that I made her several years ago. That it was April and frigid and the dress was short-sleeved was immaterial. No one even noticed the shirt she was wearing under it wasn’t part of the dress. . .though if the bodice hadn’t covered the perfectly hideous decals someone who manufactured shirts thought was stylish, it would have been painfully apparent. But of course, you can’t see, and it looks perfect. And she looks stinkin’ cute, but don’t tell her I said that. And on her feet she wears. . .
Those striped blue tights again, which I never knew striped tights could be so versatile, but the just go with so many different shades of blue. And her blue sneakers, which also match. And none of this was deliberately bought for the occasion or the outfit. She just puts things together like of course that’s what you’d do. I am pretty sure that maybe we aren’t related. Anyway, Deirdre has come to kind of sort basically take my sewing for granted, without realizing the difficulties involved. I can seemingly make up dresses in no time, but she doesn’t realize the effort that goes into them. Here’s a picture of her and her cousin, last December I think. I made them stop playing to snap this picture, so don’t expect them to look all put together. In about the space of two weeks, I realized it was nearly Elizabeth’s birthday, and set about making her a dress, which, if you ask me, was a very clever feat. See, someone had given me a half finished project (why is that people say, Oh, you sew; here, have my half-finished projects? Exactly what do they suppose is the appeal of someone else’s half finished projects? Don’t they suppose I can make my own half-finished projects?). It was a very ugly project, I am sorry to say. It was hideous. It was a women’s dress, barely knee length. It had poofy darts at the waist. It buttoned down the front. It had a long, deep v-neck. It was made out of polyester and some awful coral/cantaloupe color, or at least I color that looks awful on me. I nearly chucked it in the trash, but at the last minute I changed my mine. I don’t like that color, but surely there is some little girl in the universe who would like that color. So when Elizabeth’s birthday came around, I remembered that ugly, hideous, half-finished dress. I had this princess pattern that someone had given me, and that was my starting point. I’d scan it in for you (it was Simplicity, and I’m sure out of print), but I’m lazy. You can see a picture of the pattern here. I was sooo clever. 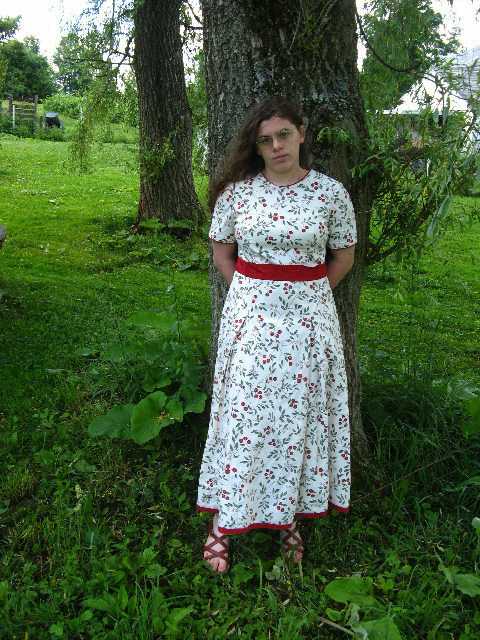 I had to piece those puffy sleeves from the sleeveless bodice of the hideous dress, though you can’t tell it from here (and alas, I only have a few pictures of this dress, most much worse than this). 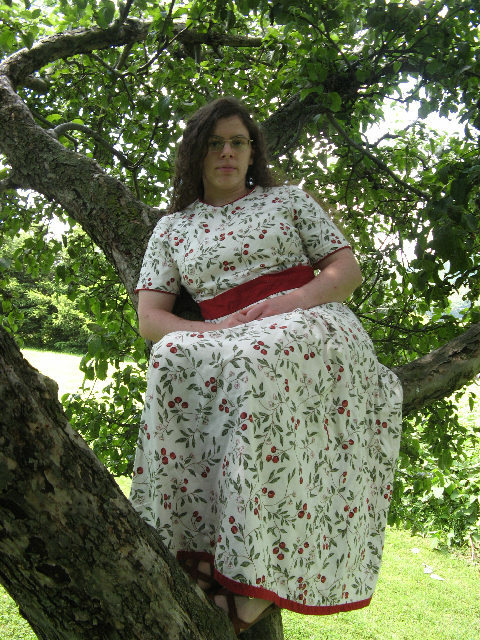 I used a different fabric for the bodice (which has batting in between it and free-motion quilting), a very versatile fabric that I actually used some of in Millie’s original fancy dress (but I am too lazy to dig up a link back that dress, so either you remember it or you don’t). I didn’t quilt the sleeves, though the called for it in the pattern, because that made them stiff and ugly, and you need to feel like a princess. You can’t see it in this picture, but the sleeves come down to a point on her hands. 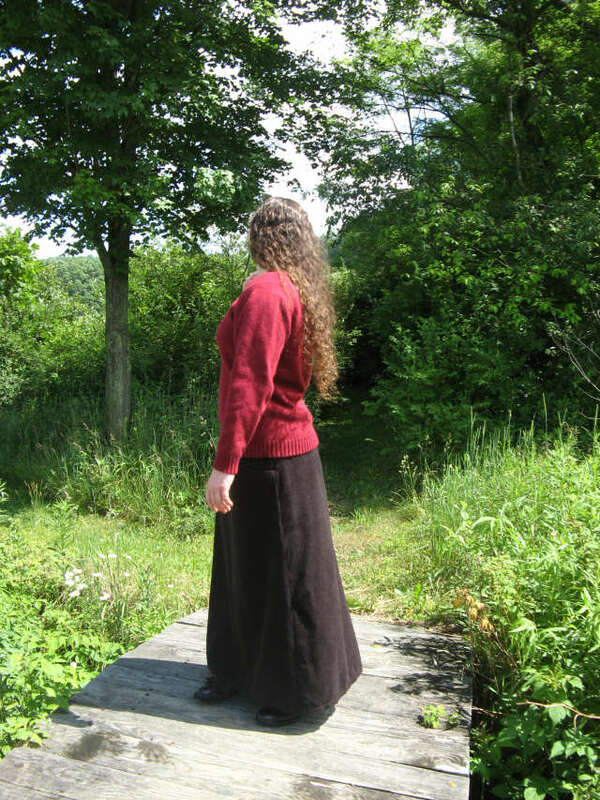 I just gathered the original (hideous) skirt, so it wasn’t as full as the pattern called for, but it was as long. 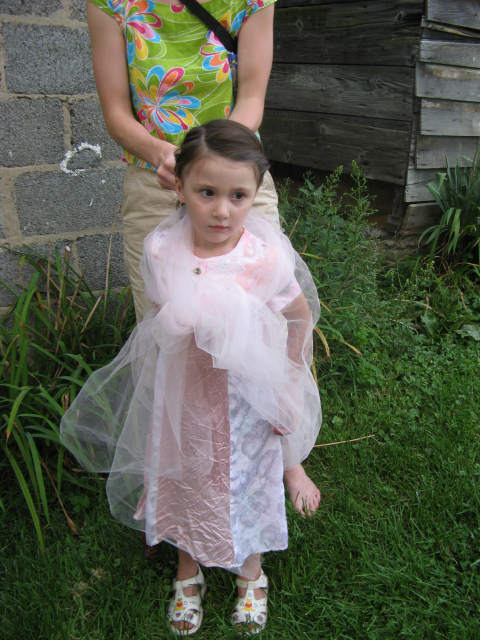 I was so please with my turning this awful half-finished monster into a cute princess dress for a cousin. Deirdre was rather blase about the whole thing, because, well, of course. That is just what I do, I make dresses out of nothing on short notice. Big deal. She has taken to coming into my sewing room and saying “You’re still working on that? !” Which is so annoying, because for one thing I agree with her, and for another, what does she know? She doesn’t know how hard it is to make things, or at least make them come out well. So when Millie’s birthday started inching squinching closer, I began plotting. 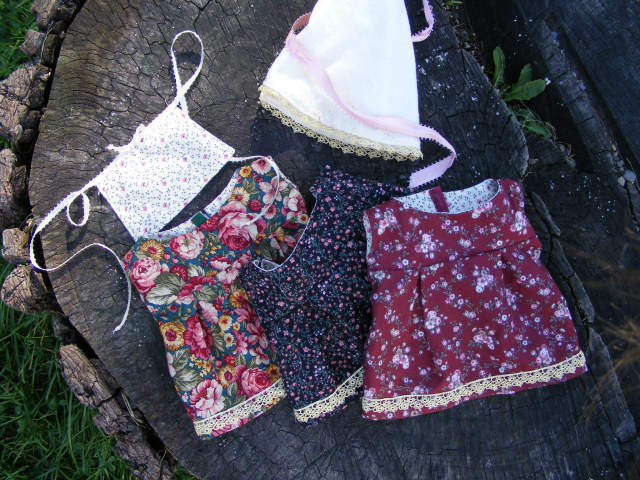 First I was just thinking I’d make a dress, because little girls’ dresses are so much easier to make, and it would go very fast. And then I thought, what on earth? Millie is Deirdre’s friend! Deirdre should be putting some blood, sweat and tears into this. It’s about time she stopped taking for granted every stitch that I sew. Naturally, I didn’t phrase it quite that way to Deirdre. And naturally Deirdre took the bait. First I picked out a pattern. It was one of those “9 great looks in one pattern! 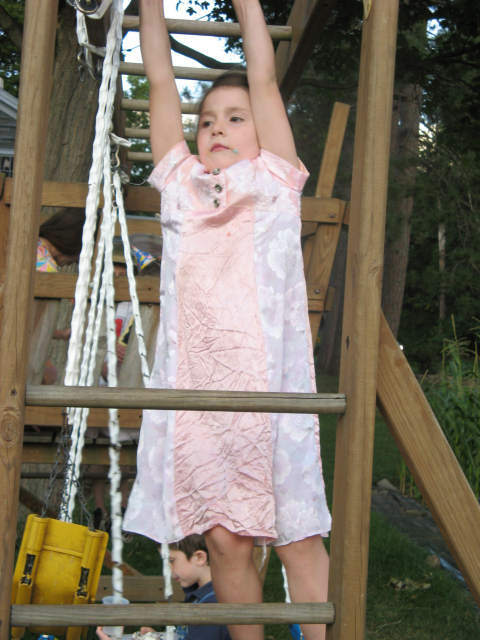 !” deals, which means you had the same dress nine times with minuscule differences, which means you can offer a six year old a choice without really offering her a choice. Brilliant, that. It was a very simple dress, so that we could actually make it in time. 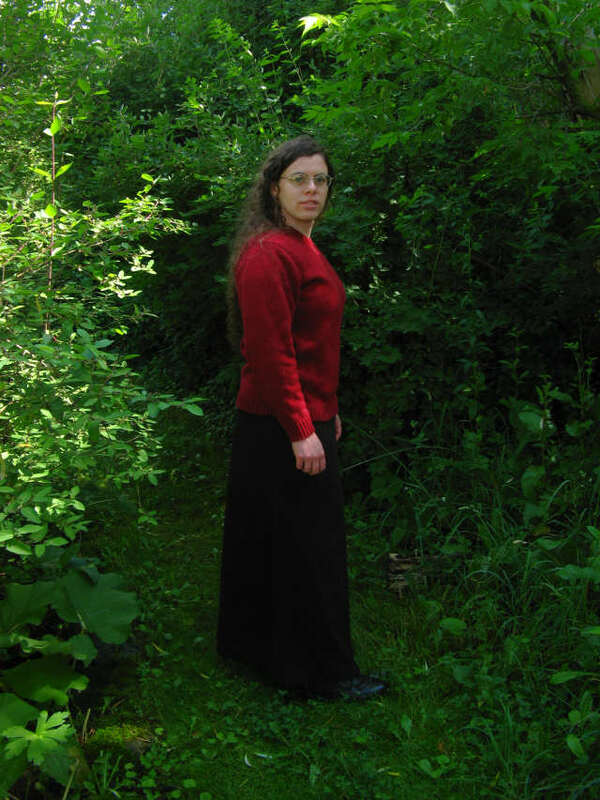 It had a perfectly rectangular skirt, gathered to fit. It could be either sleeveless or have ruffles at the shoulder, but none of that fussy-sleeve setting business. Simple, yes? But you see, Deirdre is related to me. She didn’t want to make it simple. She wanted to make it fancy. I wanted this dress to be from her, so I didn’t want to over-ride her artistic choices. Some how, we agreed to put a ruffle all along the bottom of the hem in this synthetic suede. And she did want it to have pockets. I was afraid she would pick the curvy, hard-to-sew heart pockets, but was hugely relieved when she said she was not going to do the heart pockets, because she has some pants with heart pockets and it’s way too hard to get your hands into them. (Yay, she has some shared practicality with me!) But the pockets, too, must have ruffles. It started off well enough. We prewashed the fabric in the sink. She learned why we prewash as one of the fabrics bleed dye profusely and refused to stop (well, hey, I’d bought it off the $1/yard table at Wal-Mart. You get what you pay for). In had been almost a velvet; when we ditched that was when we decided to use the suede. Guess why I had that on hand? It’s leftovers from a dress I had made her when she still needed help to stand! Since it doesn’t ravel, it was the perfect choice for the ruffles so we wouldn’t have to hem them. 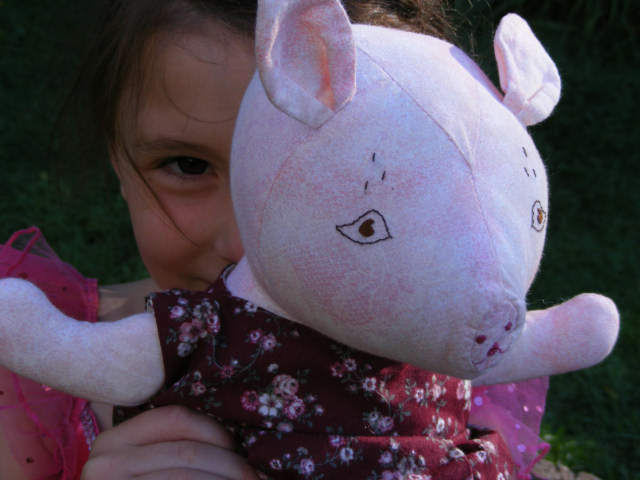 Some of the other fabric was the same as what I had used to make clothes for Millie’s piggy last year, and some of it was a coordinating print to go with fabric I had used for Millie’s piggy. So it was all come along oh so perfectly. Deirdre helped cut out. 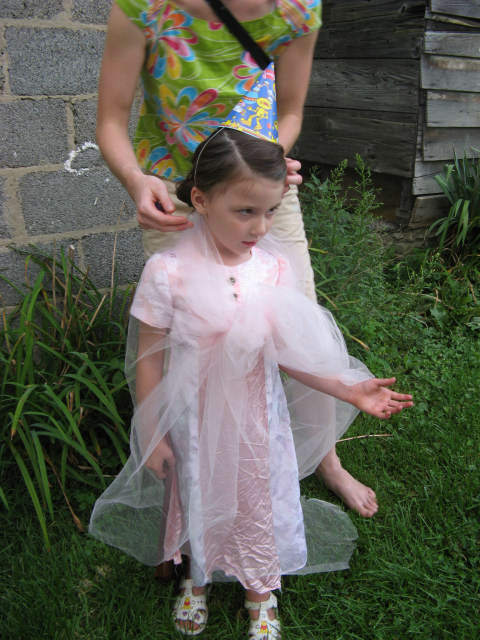 She did the square and rectangular shapes, and I did the bodice and the ruffles. And that was all for the first day, which pretty near burned her out. We sewed a little bit here, and a little bit there. It worked best, I found, to have her sit on my lap. 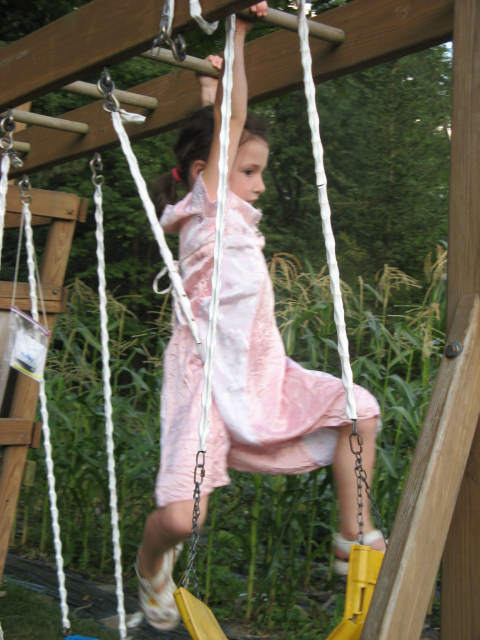 We both guided the fabric, and she put her foot on top of my foot, which was on top of the pedal. She got to make it go and stop, but if she inadvertently “stomped” on the pedal, I still had veto power and could keep her from sewing through her finger. And we sewed. We sewed some here, and some there. We used the iron. She was amazed by the wonders of turning things out, like lining the bodice, and turning the ties. Ruffling the sleevelets was just too cool. But we were running out of time. And she was finding it more and more and more tedious. Finally, there was the last day. And we were not done. And we MUST finish. Deirdre clung to images in her mind of Millie’s face when she opened it, much the way I always do when I slogging through the worst of a project. We were making progress quickly, though. 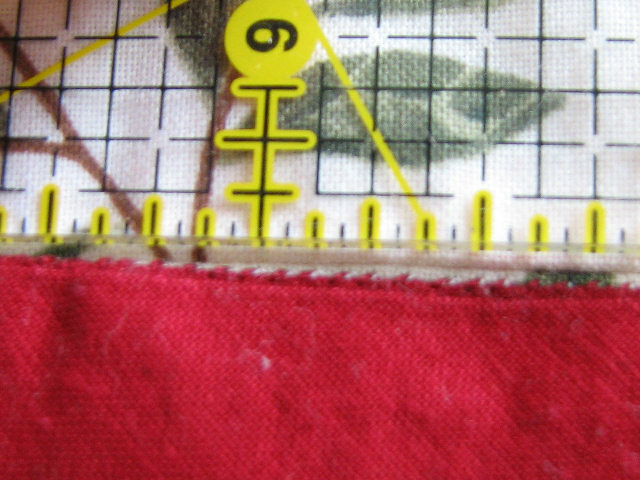 We put in the zipper; we finished the edges of the seams with a zig-zag stitch so they wouldn’t fray. We put the pockets on. But then we came to hem ruffle. Oh, the hem ruffle. First of all, it was about sixty-three miles long once it was pieced together. Holy moly. But we bravely forged on, and put two rows of long gathering stitches into that whole long snakey thing. And then we gathered it. And we gathered it. And we gathered it some more. And then it started snagging, and we started hearing very scary snapping noises. The synthetic fabric was seriously abusing the gathering thread. We didn’t have it gathered anywhere near enough, and our thread was threatening surrender. This turned it from a very tedious gathering project to a walking on eggshells disaster. If we didn’t gather it enough, we couldn’t attach it to the skirt. If the thread snapped, the altogether too much time we’d already spent gathering it would be wasting—precious time we couldn’t lose, because it was now three o-clock in the afternoon, we were supposed to be there sometime in the early evening (6 o’clock?) I had yet to take a badly needed shower, we still needed to eat supper, and of course there was the 45 minute drive out to Millie’s. We could cut our losses and just drop off the ruffle. But that was the fancy part, and we’d already put so much work into it. And we were nearly there, it’s just that the last 20% needed to be very gently eased along, tiny bit by tiny bit. Deirdre and I tried to hold onto our patience, but it was rapidly getting as frayed and worn as the thread. Hurrying would undoubtedly undo all the progress we’d made, but how could we not want to hurry with the second-hand sweeping around the clock with alarming speed? There really wasn’t much Deirdre could do with such a delicate situation, so she finally delicately suggest she might play outside until the gather part was done. It was a wise request, and probably the only thing that saved us from inter-personal disaster. Plus it meant I could focus my few shreds of sanity upon the uncooperative ruffle. After what seemed like more time than any earthly ruffle ought ever be allowed to consumed, I did finally manage to get the ruffle gathered and pinned onto the hem. I called her in, and we sewed it on. And then I quick took a shower and we ate supper very quickly, and in the car—-every true to form—I hand sewed the lining down (someone else was driving, honest! ), and crammed it into a gift bag. Finished! And in time! By about . . .5 minutes!! Yea, verily, I am teaching her to follow in my very footsteps. 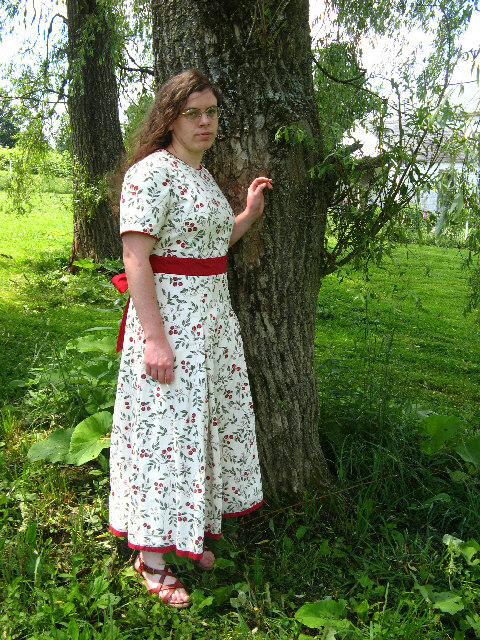 The ruffle really made the dress. Perseverance pays off, although it does take blood, sweat and tears. Or at least sweat and tears; I think we avoided the blood, and even technically (and narrowly) avoided the tears. 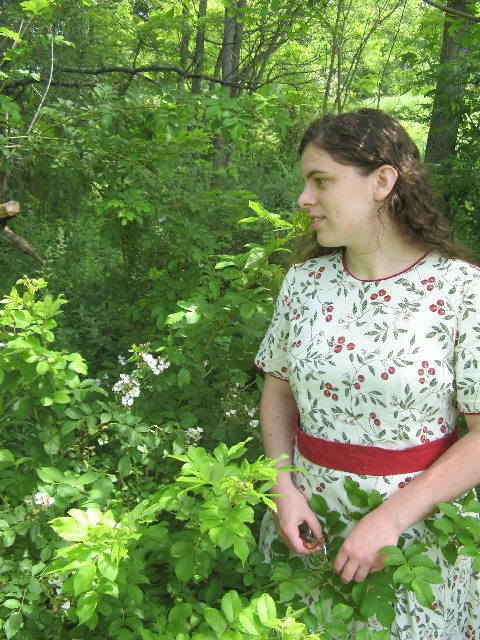 And also, Millie always makes my (and now, Deirdre’s) sewing look good, as does Abby’s photography. 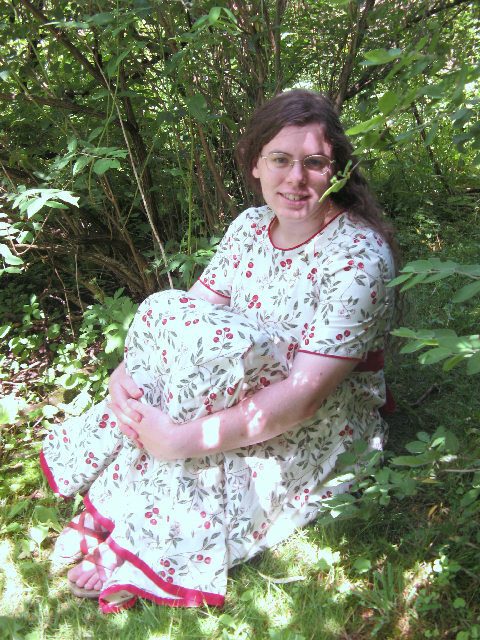 These photos were shot the same day as all the cherry-dress prictures I uploaded. We took a lot less pictures of this; I think it is because it the outfit suited me so much better it seemed less awkard. The lighting was awful though, because it was either too dark in the shade or far too bright out of it. 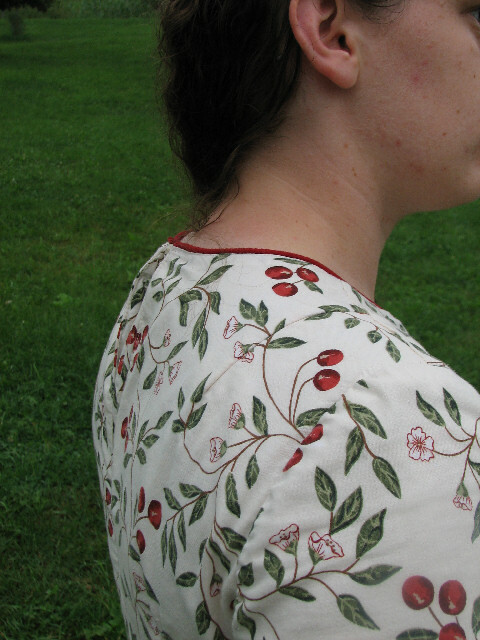 This garment is held in contrast to the cherry dress in other ways, besides what I mentioned in my last post. 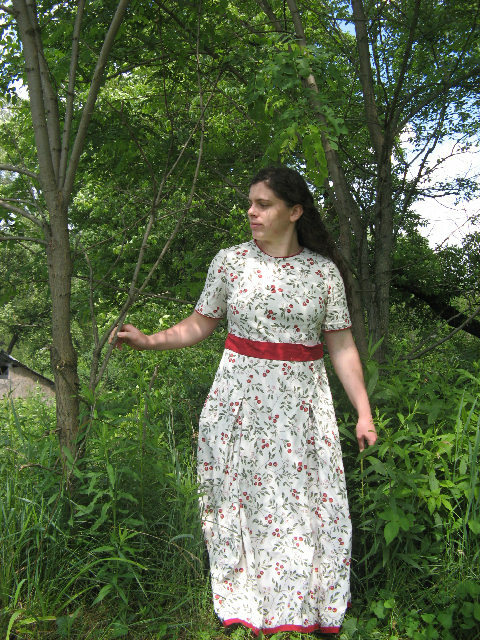 After taking such a ridiculously long time making the cherry-dress, I challanged myself to “just do it” for my next garment. Just draft it, cut it, and sew it. No muslins. No obsessing. No looking back. And that’s what I did. 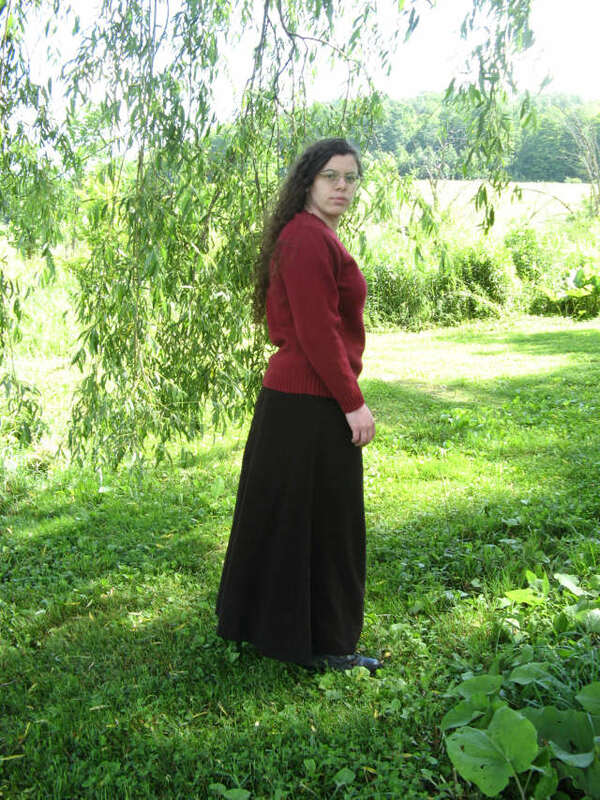 The waist is not snug enough, and the skirt has a tendency to slide down. I didn’t make belt carriers, so I can’t properly belt it into submission. 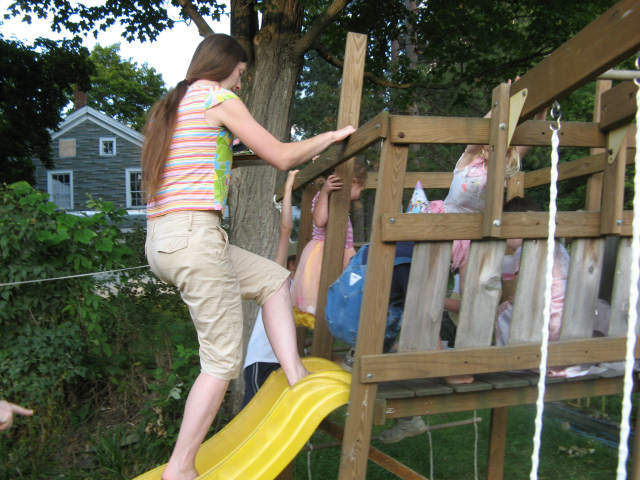 Because it slides down, it is a few inches longer than I meant it to be, which can be frustrating on stairs. 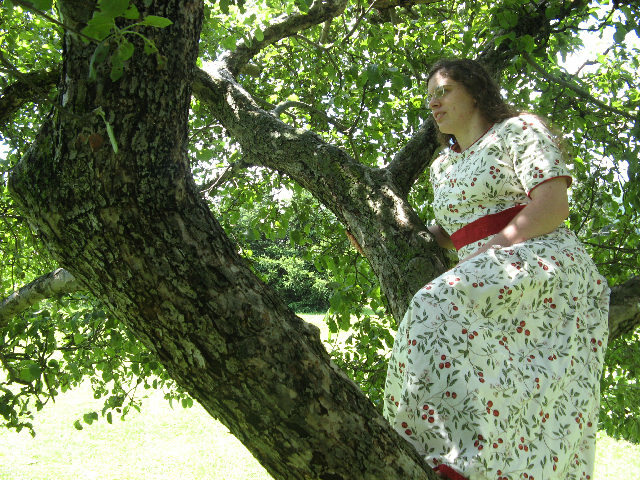 However, I’ve worn it more times than the cherry-dress, and I’ve loved wearing it every time. It is exceptionally comfortable, I find it very flattering, and it is incredibly warm. 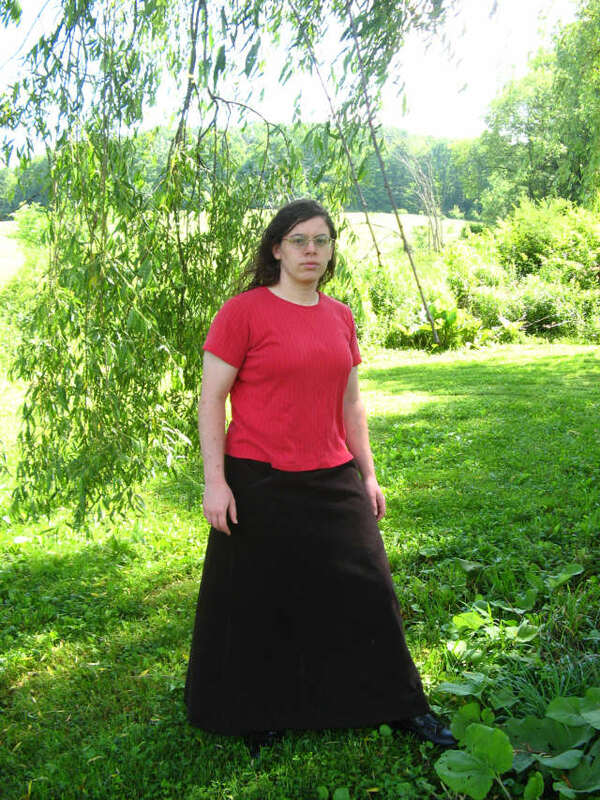 I always used to pity people who wore skirts in bitterly cold weather, as imagined the icy-cold drafts so easily slipping under the hem. 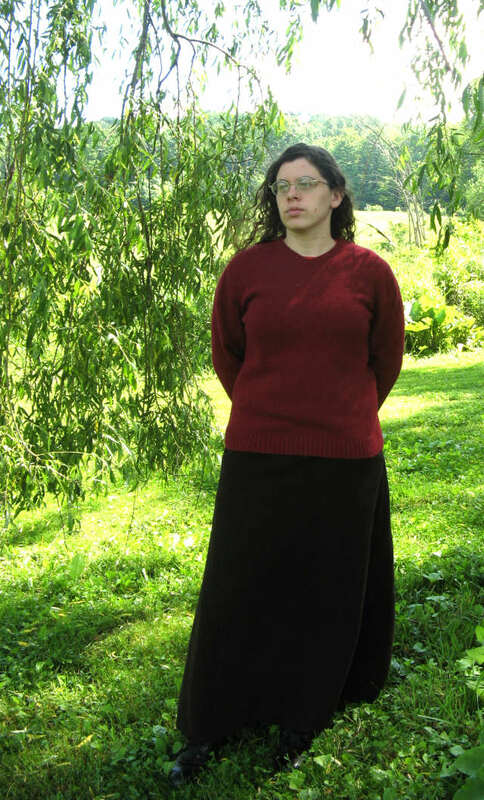 Instead, I was far warmer wearing this skirt; I think it follows the same logic as why mittens are warmer than gloves, for one thing. The only downside to that is while I would be comfortable walking around outside, I would sometimes find myself breaking into a sweat inside of well-heated homes. And if this is a testament to the insulative powers of wool, then I think we should all go back to making the investment in wool clothing, from sweaters to long-underwear, and save about a gazillion dollars in heating bills during the winter. At some later date, I’ll post pictures showing construction details, but I hope you aren’t looking for too much in the way of instruction, because I always forget to take notes and have to re-figure it out the next time. My only hope is that if I keep sewing often enough, I’ll actually be able to remember how to do thing from garment to garment. Deep red looks better on me than a lighter or brighter red. Don’t ask me what I was looking at, because I don’t know. You don’t want to see my face anyway, because I was squinting in the harsh sunlight. You do know they predicted an overcast day, don’t you? I suppose that should have been our first clue it wasn’t going to be. Yes, my skirt has pockets! Two of them! They came out very nice, but when it came to working on the next garment with pockets, I didn’t have the foggiest idea how I’d done them before. I’ll show you better pictures later. Blotchy sunlight makes your face look weird. Now I’m not blotchy, but it’s far too shady. And my hands are itching to work on something. Standing around doing nothing is counter to my nature. 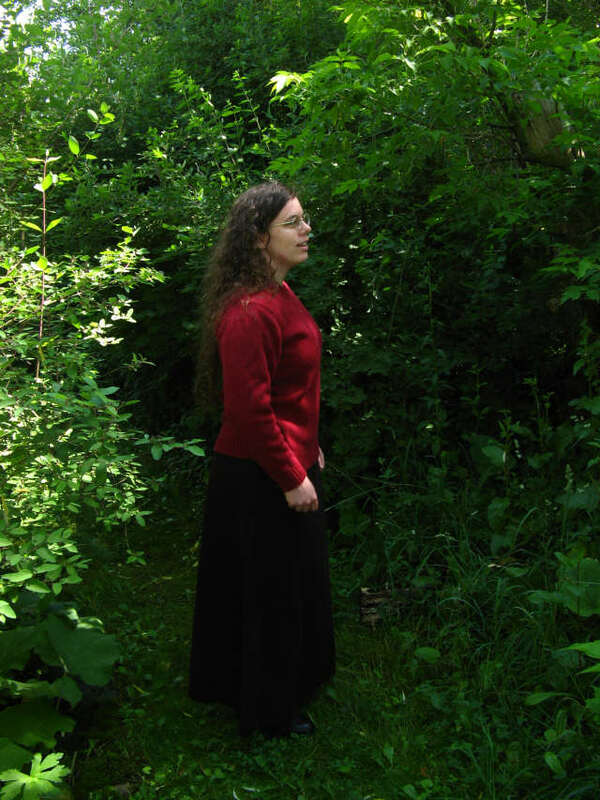 I should have taken along my knitting, or something, but that of course would have obscured the skirt, which we were attempting to document. So my hands hang awkwardly. Somebody cue the music—here it comes!! Which? What? Pictures and stories of my first ever self-drafted dress! That I finished last year, and never told you about, and finally now am gracing you with it’s presence! It is, basically, proof-positive that I finished Pattern Drafting 101. Taught be me. I was at the head of the graduating class. Which was only me. Anyway, this is post is dedicated to Bridget. It’s all her fault. No, not really. Really, I could “Thank You” to a million people. Not really. I don’t know a million people. But there is the author of my one-and-only text book (Elizabeth Allemong and her wonderful book European Cut), and my sister who patiently took all my measurements a half-dozen times, and my aunt who introduced me to the world of sewing (but she’d probably die a million deaths if she realized she was responsible for starting me down this path, because for heaven’s sake you’re not supposed to take hobbies so seriously! ), and my parents who borned me into this world in the first place—but I’m dedicating this one to Bridget. ‘Cause otherwise I wouldn’t have finished it, and it doesn’t matter how well you start if you never, ever finish. Oh, I guess I probably would have finished it. Eventually. Sometime. Maybe. But I was getting so sick of this project. I had reached ultimate saturation. I didn’t want to look at it, didn’t want to think about it, didn’t want to work on it. And every time I looked at it, it seemed like it looked worse than it had the time before. And I was, like, 90% of the way there! It just needed finishing up, hemming and boring stuff like that. But instead, it had been tossed into a corner and was just sitting there. Bridget gave me the encouragment, that yes, actually, it’s coming along quite nicely indeed. So finish it. Also, she kept me company while I cut, sewed, pressed and hemmed 177″ of bias binding. You really, really, really need company when doing something as tedious and mind-numbing as that. Besides all that, you’d never being seeing this post except for her. She helped me cull through the over 130 photos my (very wonderful) sister took of me wearing the dress (yes, the same sister who took all my measurements!). It’s really no fun looking at over 130 photos of yourself. Then again, maybe she didn’t have fun looking at 130 photos of me, either, but she did it anyway. A true friend (but I’m sure the brownies didn’t hurt, either. . .they were really good brownies). Anyway, yes. The dress. And me. Brace yourselves! You simply would not believe the tedious hours that went into making this dratted thing. The 177″ of homemade bias binding hem is just the beginning. Besides the hem in this picture, you will note a couple of other things. For one thing, the whole dress is underlined. Interlined. Regular old lined. Something. Having bought this fabric way too many years ago when I was young and foolish, I failed to be deterred by the fact that it was rather thin. Very thin. Thin enough it really needed something more to keep it decent. This caused some disappointment to me later on. It may have needed two layers of fabric for opacity’s sake, but those two layers make it much, much warmer. Not so great for wearing during already-quite-warm-enough-thank-you-very-much weather. 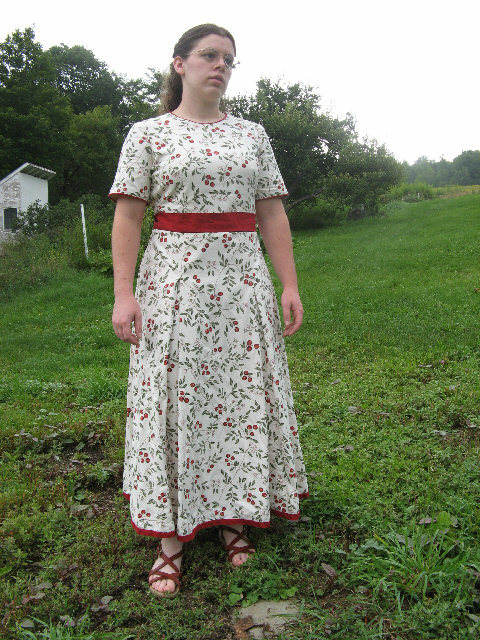 Everything I have ever read has claimed that building a dress like this will make it less prone to wrinkling, but the whole thing is 100% cotton, so I doubt you’ll see much of a difference on that count. A second thing you will notice is all the orange thread-tracing lines. Techincally, now that the dress is done, they should be taken out. But that’s fuss and bother, and you can’t see them from the outside, and I’m quite finished working on this. I’m not in the least bit repentant of doing all that thread tracing, though. It was extremely useful for getting the pleats to line up right, and the darts and everything else. It is a time-eater, but if I ever have pieces-that-must-line-up, I would do it again in an instant. It was very reliable, didn’t go away until you wanted it to, and then did go away when you did want it to. It was Precise. I liked it. This is the inside shoulder; you can see the back shoulder dart. If you look close, you can see my hand stitching securing the muslin underlayer shoulders to each other. I was really doing quite the hybrid. 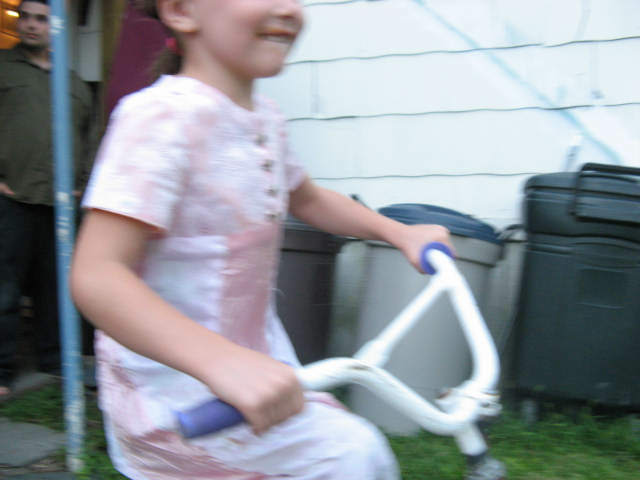 I sewed a lot of the dress treating the muslin and the “fashion fabric” as one—the darts, and most of the seams. But where ever it tickled my fancy, I did it otherwise. 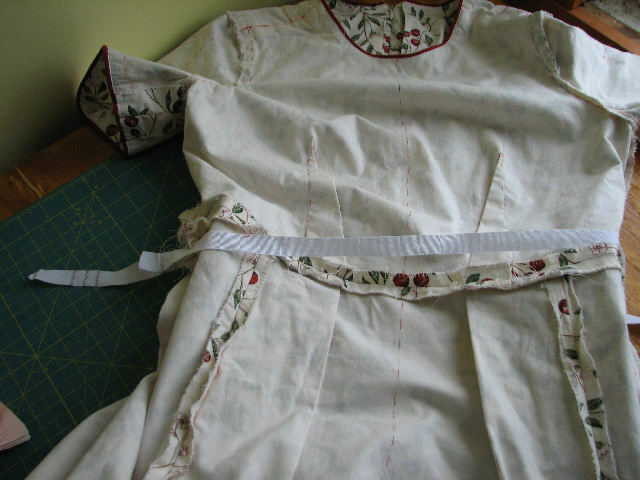 The side seams were sewed together, but the inner and outer skirts were hemmed seperately. 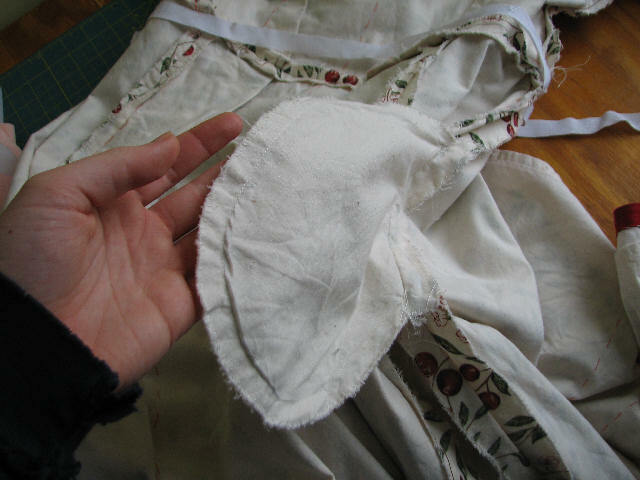 The muslin was treated as a lining at the neck and sleeve ends, sandwiching the (self-made) piping in between. And here, I sewed the “fashion fabric” shoulder seams seperately from the muslin, and descreetly hand stitched the muslin shoulder seams by hand. It made for a nice smooth finish. Not that it was all so fine. 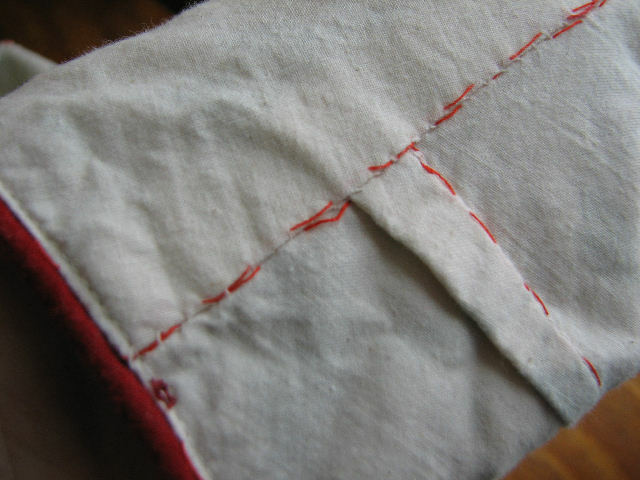 Most of the time I just zig-zagged the seam allowances. I didn’t have a serger at the time. . . Yes, you do see a waiststay. I was very ambivilant about putting it in. They say it’s supposed to support the weight of the skirt, and keep it from straining the rest of the dress. Having a hem that was 127″, and double layers of fabric, I thought that maybe it was necessary. But it’s rather uncomfortable, and I’m not sure at all that it makes any difference in the least. Especially since this was supposed to be a casual dress. Maybe if I was using fine, delicate fabric, I would be more worried. As it is—-it’s cotton. It’ll survive. Or not. I’m not too worried about it. I say it was “supposed” to be a casual dress. It was. 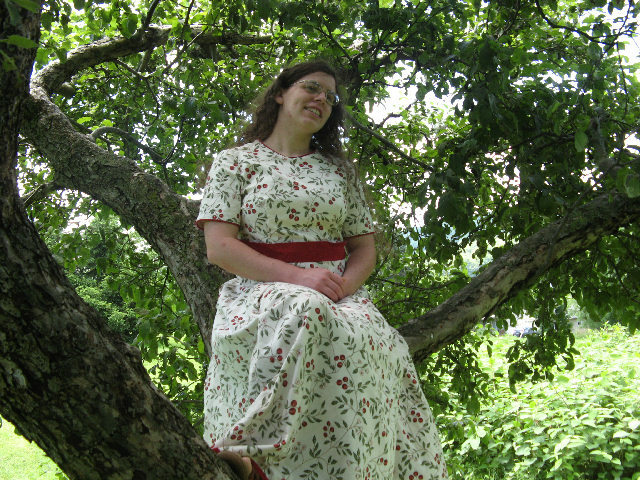 It was supposed to be the kind of dress you could host a picnic in—unfussy, but nice. The only reason I thought I could get away with such a fitted bodice is because I very cleverly added an ease-pleat in the back of the dress. See? Very clever. I even precisely matched the print. Only problem? Sorry, Miss Knucklehead. You need your ease further down than that. As it is, I nearly burst a seam when I try to scoop ice cream, which means that whenever I wear this dress, I feel formal. And by “feel formal” I mean, I feel like I’m good for nothing but standing, prim and proper. Or maybe walking. But not doing anything that involves my reaching with my arms, with eliminates a startling number of activities. Half the time I ignore the “don’t move!” feeling and get on with my life anyway, but it is just not the casual do-anything dress I’d invisioned. I feel like such a failure. Kind of. Not really. The fit is really good, but I’m still pretty annoyed with this dress. Oh, well. At least I remembered to put in a pocket, and that’s once less annoyance. 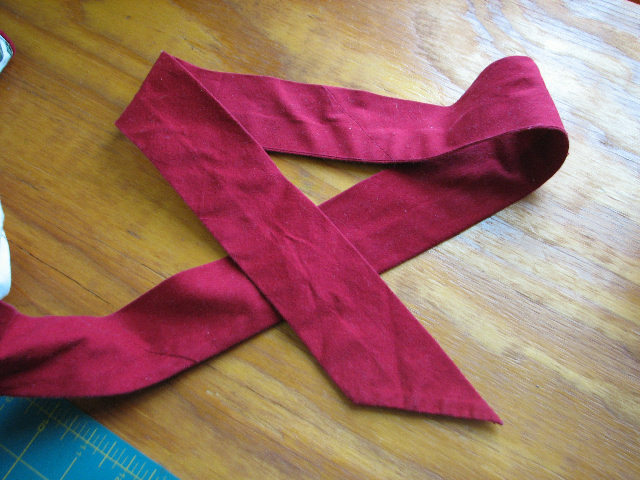 The dratted back ties—they’re dratted because (1) I can’t tie them myself; I never mastered bow-tying behind my back, and (2) I cut it on the bias, which made it very difficult to sew without distorting. Why did I do that? I don’t know. I think I thought the ties would be more fluid and coopertive when tied. Maybe they are. . .
Its loose in the back, but stitched down in the front, along the bottom edge. By hand. After tediously sewing it on by hand, I got it into my head to measure my stitches in their regularity and size. . .
Whoa. 1/16th of an inch, square on, everytime. Freaky. I guess maybe all my hand-quilting is paying off? Somebody go tell the atliers I’m readying for hiring! I put a lot of silly stress on myself while working on this project. I just felt like it had to be perfect. It was a like a thesis paper, or something. It had to be the proof that I really truly had been learning, did learn. That I could draft to specific measurments and produce quality sewing. As such, how could I ever be fully satisfied with it? Every little mistake seemed like a disaster, completely obscuring the view of the rest of it. Instead of being pleased with how much I had accomplished, I wound up just being disgruntled with every little place where it didn’t seem to me to be perfect. Maybe that’s why, having drafted basic slopers that would enable me to make any dress, skirt or top I could possibly imagine, the only thing I wanted to do next was figure out how to make pants. Instead of feeling like I’d accomplished dress-making, I felt like I couldn’t measure up, and wanted to divert my attention elsewhere. Thankfully, I’ve relaxed (at least a bit), and my pattern drafting has continued. 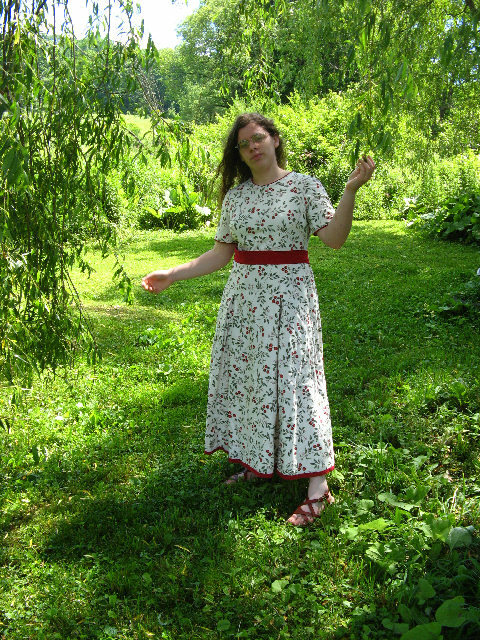 Besides, till this dress, I had only made 4 pieces of clothing for anything other than children. 3 of them were jumpers, and none of them came close to fitting. I do believe I shall give myself a passing grade. For piggy number one, girl number one insists upon calling it “Piggy”, and mother number one tries to convince her to give it an actual name (in this case, “Rose”). 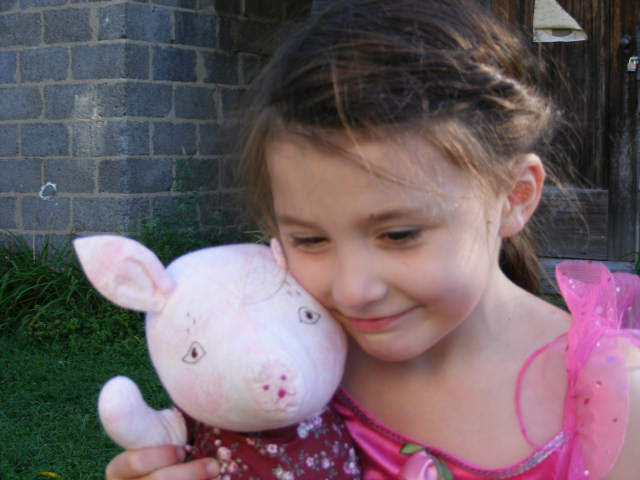 For piggy number two, girl number two insists upon calling it “Piggy”. 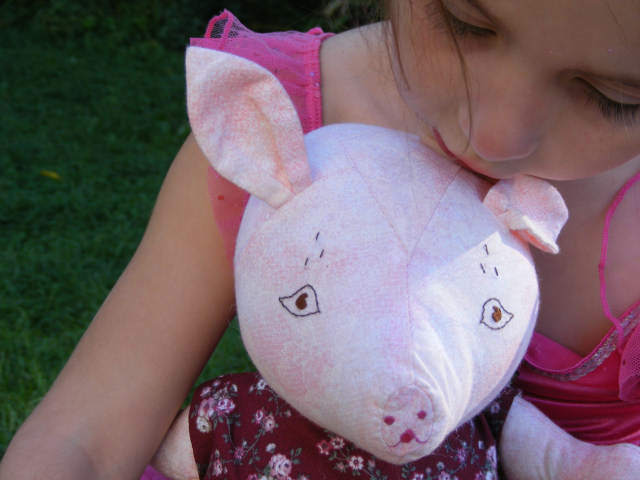 Her mother is currently trying to convince her to give it an actual name, in this case, “Piggly-Wiggly”. So both piggies have the same name right now. And Abby sent me photos! 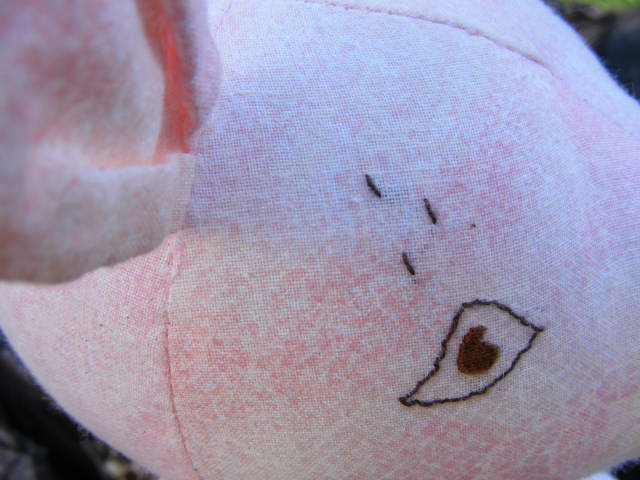 Piggly-Wiggly has embroidered eyes. . .
. . .and snout (which has been set in crookedly, but don’t notice that). 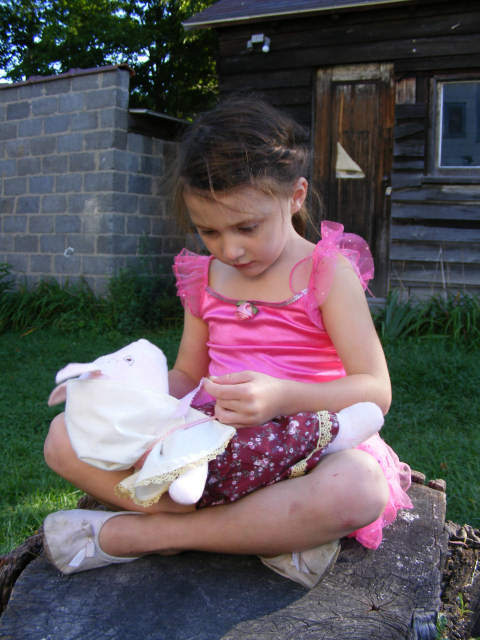 Millie studiously dresses the piggy. . .
in clothes that have been lined and pinked. 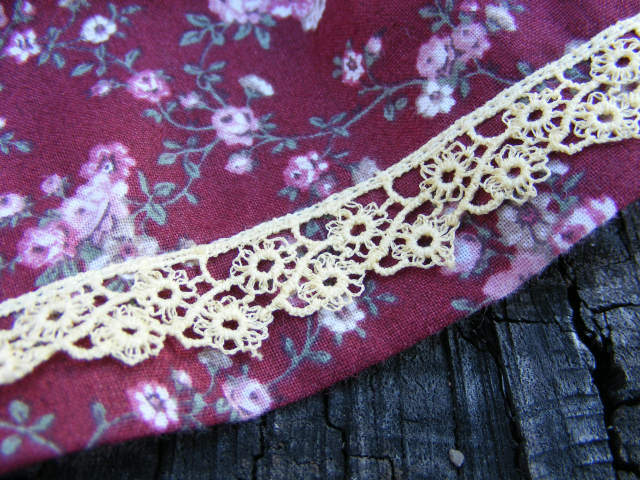 . .
trimmed with aging lace. . .
Also, I just really like the bow detail on the apron. I’m particularly pleased, because it was a mistake. I cut my length of ribbon in half and attatched it to either side of the apron. It looked terrible. 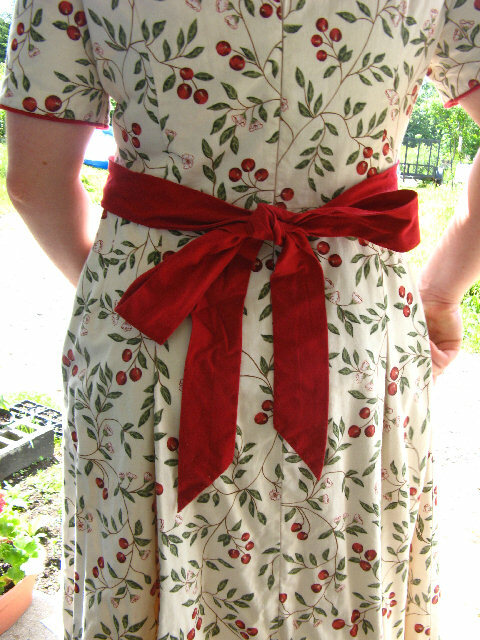 I realized I should have kept the ribbon as one length, and just sewn it to the top of the apron. I didn’t have any more ribbon, and it would look a million times worse if I tried to sew the ribbon together. So I knoted the ends of the ribbon to keep it from fraying, tied the to pieced together, and sewed it along the top of the ribbon. And now it looks really, really nice! Also, if you are a really long time reader, you may remember my post from last year around this time, on my old blog. I had made this same girl a fancy dress, that fit her so perfectly (much to my shock) I was sure it wouldn’t be fitting her in another year. Well, guess what? 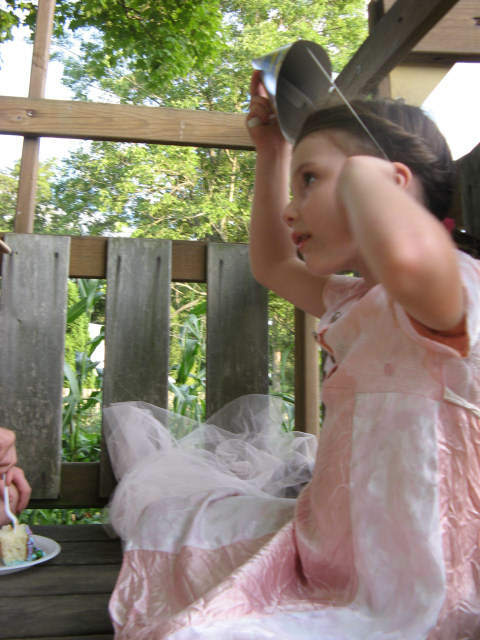 The party was outside, and Millie and several of her guests chose to eat inside the play fort. When it was ice cream time, Abby went up to serve them! You can barely see it, but she’s got a tray full of ice cream in the other hand. And those are the long awaited photos! So last Friday evening, the 10th, I checked my email and saw that I had an email from my friend Abby that contained the line “Also, Millie’s birthday is next Friday. . .on the off chance that you’re able to come, no gifts needed, missy!! !” I read it carefully. Very carefully. It said “needed”, not “allowed”, so I figured I was still okay. Besides, last year she said that, and everyone brought gifts anyway. (They did this time, too, for the record.) And ever since I made piggy number one, I’ve wanted to make a second one. 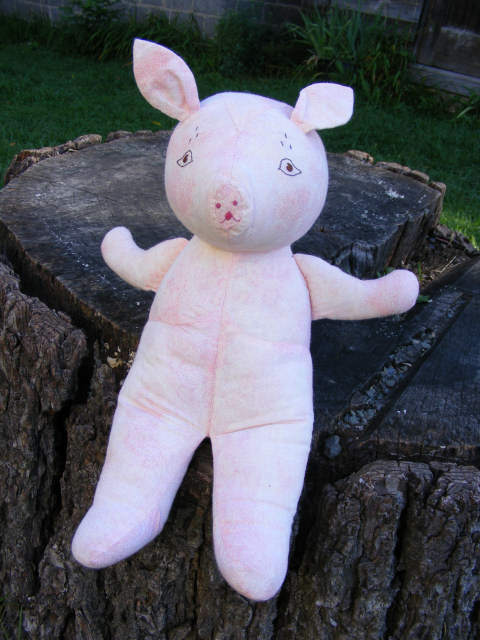 Question: How come it takes me 4 years to make myself ONE dress, but only a scant seven days to make a stuffed pig complete with three dresses fully finished, an apron, and a hood? Answer: I don’t know, but I think it has something to do with why the zipper on the fancy blue dress I’d made (which failed a few months after it was made) has yet to be repaired. I told myself I’d fix it when I sewed the buttons back on my favorite shirt. Which hasn’t happened yet. For the purpose of working toward my certificate of insanity (my sewing room walls are bare; I need to hang something on the wall. I think a certificate of insanity would look nice up there), I’m going to show you all how I did it. On Friday evening, I pulled out the fabrics I had set aside 4 months ago for this express purpose. On Saturday, I washed the fabric, and accidentally stayed up to 11 pm ironing it. There’s no clock in my sewing room. At this point, my father already beings to question my sanity. On Sunday, um, I can’t remember. I think I forgot entirely about it. On Monday evening I carefully and precisely cut the skirt rectangles. And I think I cut out all the body pieces for the piggy. On Tuesday evening I sew together the ears and the arms. On Wednesday, I start feeling the first pangs of panic. There are only 2.5 days left, and I’ve hardly gotten started!! I embroidery the face before supper; afterwards, I go over to sew with a friend (pre-arranged 3 weeks ago). We stay up till ten o’clock working together, but since when we work together I keep stopping to talk, I don’t make as much progress as I might. The head is assembled, the back is assembled, the front is assembled, but nothing is connected. On Thursday, the panic really starts setting in. Abby and her kids are supposed to come mid-morning to pick blueberries with us. I spend the morning trying to get the body pieces connected, which is made a little bit more difficult because I left the instruction at my friends house. I finally do get it put together, but I’m 10 minutes late to the blueberry patch because I lost track of time while trying to get the arms put on right. First I would see that the fabric had wrinkled, and I had caught too much of the chest up in the arm. So then I rip it out, and re-sew it. Then I see that in some places, the arm had slipped out, and there are holes. So I rip it out, and re-sew it. 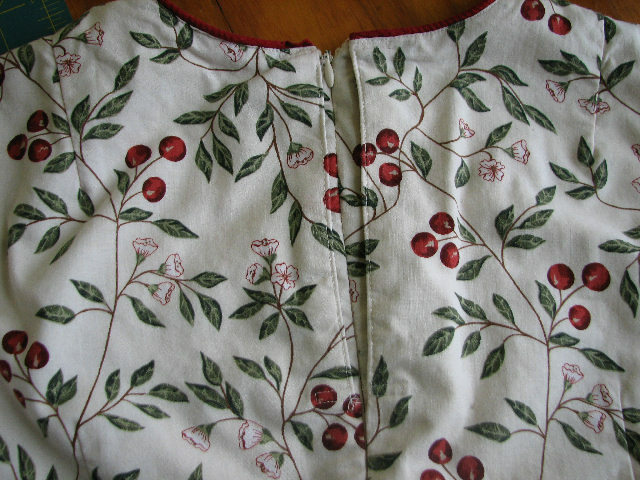 Then I see that the fabric had wrinkled, and too much of the chest had gotten caught up in the armhole. I finally got it right, and cleared away most of the storm clouds above my head before getting to the blueberry patch. When I got home, I immediatly sat down and started sewing. Panic is now full-blown. The good news is that since this is the second time I’ve used this pattern, I know all the places where I can take short cuts. The bad news is, I thought the dress pattern was faulty (really the last piggy had stretched), and so I wasted precious time trying to “fix” the bodice before realizing it actually fit this piggy pretty perfectly. Cut the bodice, front and back, out of the “fashion fabric”. For the back piece, I slide it about (I only eyeball it) 1/4 inch away from the fold, because I need a little extra room for fastening the dress closed. Cut the bodice, the same as above, from the “lining fabric” (just a different cotton print) According to the instructions (and what I did last time), I’m supposed to bind the edges with bias tape, and make little sleeve bands that will need to be set in. I skip both of those, because this is so much faster. 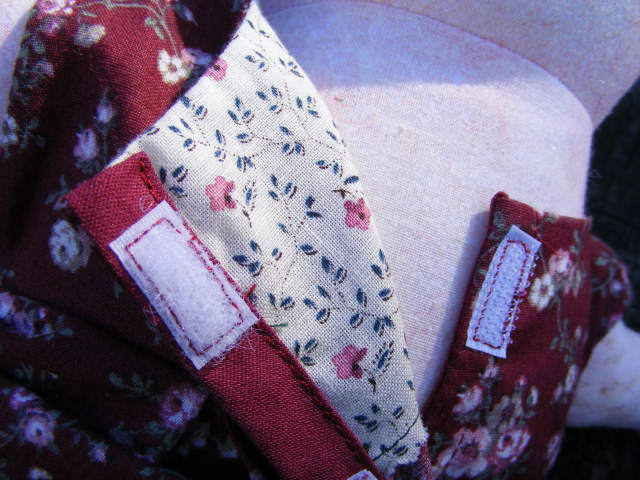 Sew the lining to the bodice along necklines and armholes. Pink the edges of the above seams with pinking shears that are getting dull. Turn the pieces, and finger press them on my leg. No iron actually ever touched this project, which was a far cry from how carefully I pressed everything in piggy #1. For the bodice front, I pin the skirt piece to the bodice, matching the corners. Then I pin the center (I just fold it in half to locate it) of the skirt to the center of the bodice. 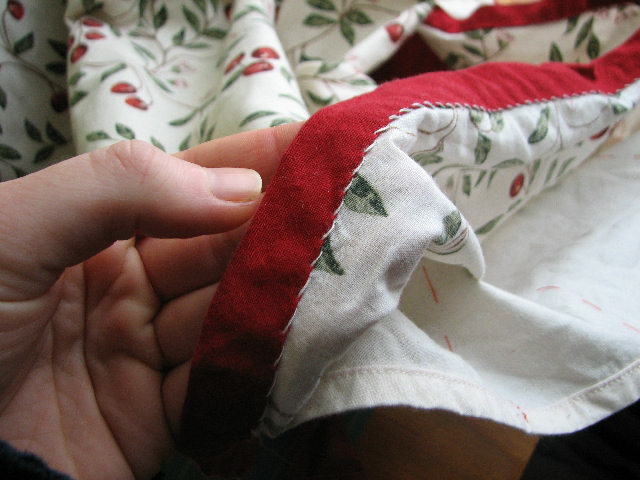 Then I just guestimate about where is half-way between pins, and pinch up the extra fabric there. I flatten the pinch to either side, and pin it in place. This makes an inverted box-pleat. Then I sew it in place. I repeat it in the back. 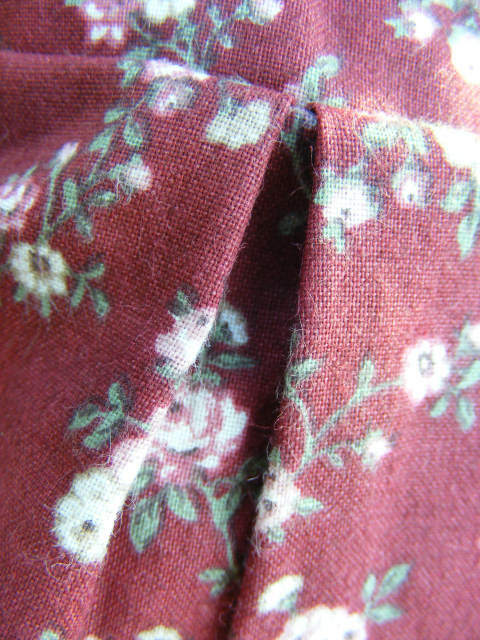 I pink the bodice-to-skirt seams and the shoulder seams with getting-duller pinking shears. 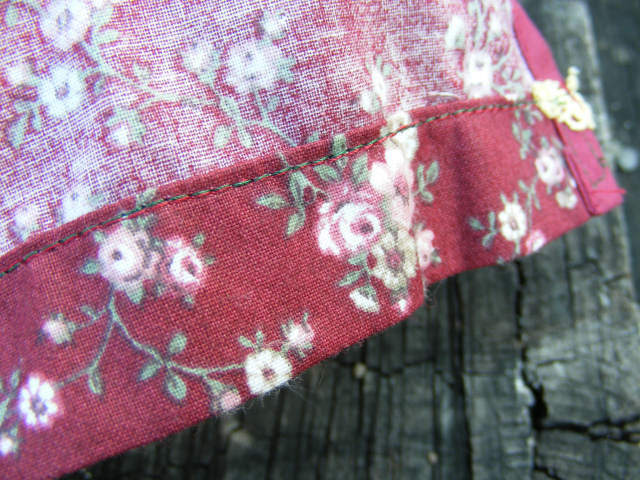 I sew the side seams. And pink them with dull shears. And then I haphazardously turn up a hem, but I could have left that part out, because I wound up making them shorter. This was also a far cry from how I did it on the last one, where I was so carefully measuring 1/4 of an inch, pressing it under, measuring an inch, and pressing it. This time, no measuring, no pressing. All of that took me half an hour. I give an embarrassed giggle. I’m doing pretty bad, speech-wise, even for me. Usually she can get 98% of what I say. So I translate, and then hang up, and throw everything I think I’ll need into plastic grocery bag, and dash out the door. I stay there two hours, in which time I assemble the third dress, re-hem the three dresses to a better length, and finish off the back opening of two dresses with bias tape. I’m half-way through finighing the opening on the third dress when the power goes off (and any way, it’s time for their supper). During that time, Mrs. M suggests using velcro instead of snaps up the back, which is a really good idea, because I can attach it by machine, instead of by hand. I get home, and the power comes back on, but we’re going to have a late supper. 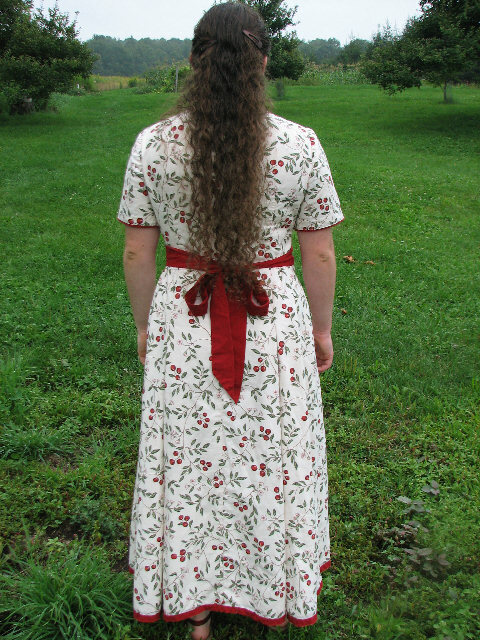 So I finish the back of the third dress. Then I start looking to trim the dresses. 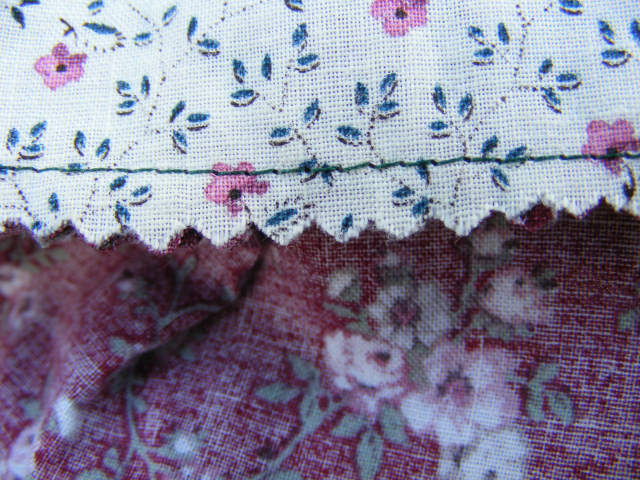 Orignally I had thought I would use 3/4″ lace as sleeves, but decide any kind of sleeve is out of the question. I look at various types of ribbons, but finally say, “Self, who are you kidding? You need to do this as fast and as simply as possible. 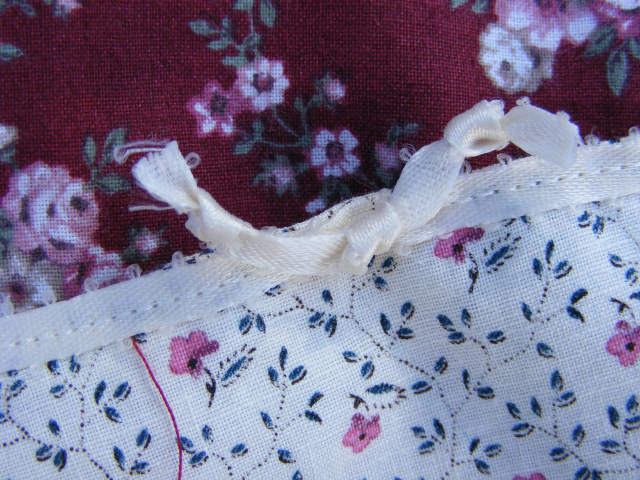 Just pick something and go with it!” So I sew the 3/4″ lace along the stitching line from the hem. 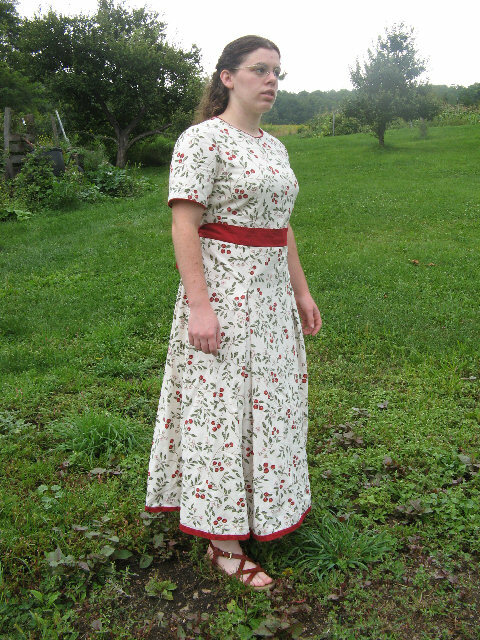 I’m working on the last dress when I’m called to supper. Did I mention supper was late? And also, it was my night to wash. And I couldn’t trade, because I’d just traded on Wednesday, so I could go sewing with my friend. Here it is, Thursday night. I have to go to my grandparent’s all Friday. 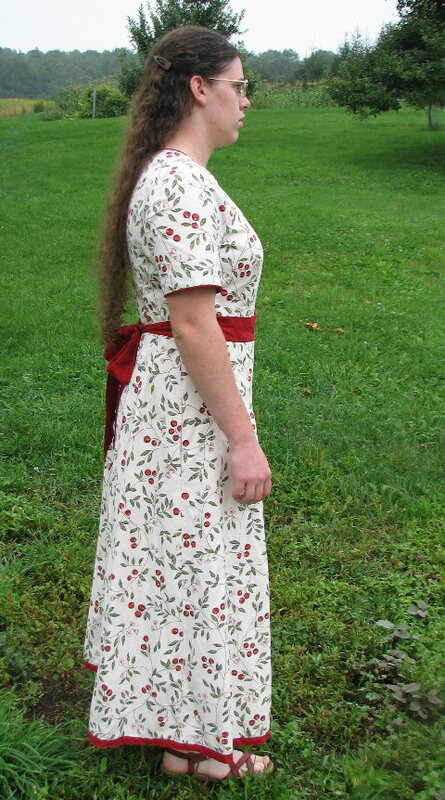 I still have the rest of a dress to trim, velcro to apply to the backs of all the dresses, and I had wanted to make an apron (no pattern) and a hood (have the pattern for). And the piggy still has a hole in it’s belly, where I stuffed it. It needs to be sewn up by hand. Instead, I am washing dishes. Until 9 pm. 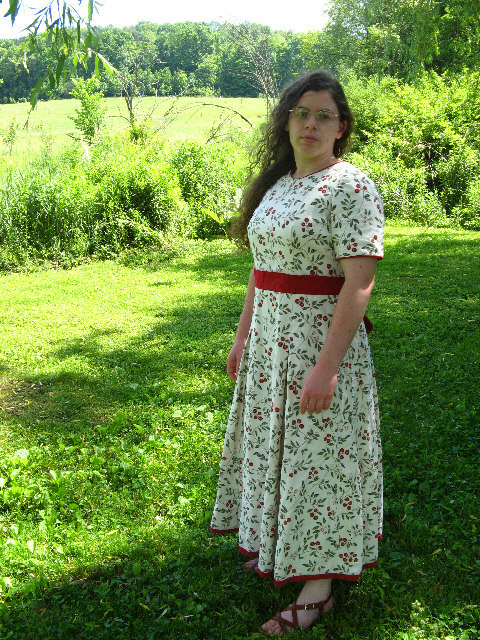 I manage to squeeze in about an hours more worth of work, in which I finish trimming the last dress and make an apron. Friday Morning I’m running around like a chicken with my head cut off. I toss everything in the car, including my sewing machine, my bag of stuffing, lace and fabric and multiple thread colors and scissors and a box to wrap it in. I get to my grandparents house, and instead of mopping floors and vacuuming like a good little granddaughter, I spend the morning sewing on velcro and sewing up the stuffing hole and making a hood. By early afternoon, I’m borrowing my grandmother’s wrapping paper and tape. Finished! I spend the afternoon vacuuming, mopping, making cups of coffee for my grandpa, helping him with bathroom difficulties, and helping my brother bring in the groceries and make supper. He graciously agreed to make supper an hour earlier, so I could drive out to Abby’s while it was still light. I have mild issues with driving. Not panic attacks or anything, but severe dislike and a strong dread of driving anywhere I haven’t driven before, or haven’t driven very many times before. (The funny thing is, I’m quite relaxed being the navigator, and riding shotgun and telling someone else where to go when I’ve never been there before.) I’ve been to Abby’s house a few times before, but on Friday I had yet to make it there and back again without getting lost, confused, mixed up, or missing turns. So I was really dreading the driving, and especially trying to find her place in the dark. Anyway, I finished it, and I got it to the party on time. But I don’t have any pictures of it. Because my sister’s camera got it’s memory card filled up before we got to present opening, so I took pictures with Abby’s camera. But I didn’t get to take any pictures of Millie opening it, because it started pouring rain, and I asked Abby to pause the party. Then I dashed outside to close the windows, and while I was gone, Abby tried to pause the party, but some kid handed Millie a package behind Abby’s back. And so Millie opened the piggy and neither me nor Abby nor the camera got to see it. I told Abby she had to take pictures of the piggy in better light and send them to me; she owed it to me because I got a picture of her camera-shy husband on her camera! So if you all get to impatient for photos, nag Abby. I’ll foward your comments until she is over-come with guilt.